What’s the best food for your kitten? See our 5 tips for choosing a kitten food. Have a new kitten? Congrats! You chose the perfect one (super cute), but you still have a few decisions to make, like: What should I name her? Where should I put the litter box? What should she eat? Luckily, we can help with this last one. DHA & other Essential Fatty Acids – DHA is an omega-3 fatty acid that’s present in mother’s milk. It’s especially beneficial for kittens because it supports healthy brain and eye development. Omega-6 fatty acids, from ingredients like salmon and flaxseed, can also promote healthy skin and coat. Digestibility – Transitioning from mother’s milk to solid food can be a bit rough on a kitten’s tiny, sensitive tummy. Check the ingredient list for easily digestible ingredients, like pumpkin and egg. Healthful Ingredients – Look at the other ingredients. Are they high quality and nutritious? While cats ARE carnivores, certain wholesome vegetables, like spinach and peas, can provide beneficial antioxidants, vitamins and minerals. Purr-worthy Flavor –The best way to ensure your kitten gets all of the calories and nutrients her body needs? Irresistible flavor! 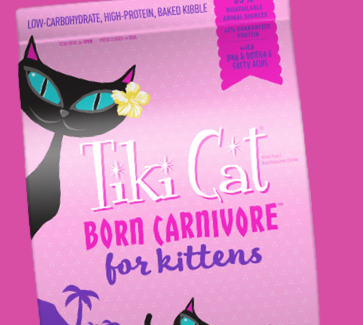 Tiki Cat® Born Carnivore™ for Kittens, for example, includes nutrient-rich chicken liver, a flavor cats love. And, the kibble is baked, not extruded like many other kibbles, which caramelizes the surface for delicious, fresh-from-the-oven taste. Hopefully this helps take the guesswork out of feeding kittens, so you can focus on your other decisions (how about Princess Fancy McFluff?) and enjoy your new kitten! I LOVE LOVE LOVE feeding my babies tiki. When I saw that you came out with a new kitten formula it definitely helped me make the decision to get a kitten. So far so good. She loves the food but wishes she could have her sister’s yummy wet food. I recently adopted an abandoned kitten, so wasn’t sure what he was used to eating. After doing a lot of research, I choose a couple of brands and bought a few cans of each. He didn’t always like the others, but Tiki Cat is a winner! He took right to it! Sometimes the dry food, sometimes the canned, but he always eats Tiki Cat. I’m so happy to know that I can keep new kitty healthy and well-nourished.